So Mr MoaB's sister turned 40 last month. Unfortunately we weren't able to make a trip up North to celebrate but we're going to make it up to her with a family weekend away in June. We were struggling to come up with a good present for her so I suggested that we do '40 Things Beginning with 'B' (her initial). At first Mr MoaB really didn't get the idea and had visions of it costing a lot more than we could afford to buy 40 things! However, I managed to convince him that when my Mum and I have done this for people in the past, it's been really well received. No-one is expecting to get so many gifts, let alone all of them beginning with their initial! I also told him that people appreciate the effort you've put into the present as it takes some time and creativity to come up with the right number of things. In the past, we've done 17 Things Beginning with S, 30 Things Beginning with C, L and J and a real challenge was 50 Things Beginning with V! I decided to set a budget for the present to stop it sprialling out of control. 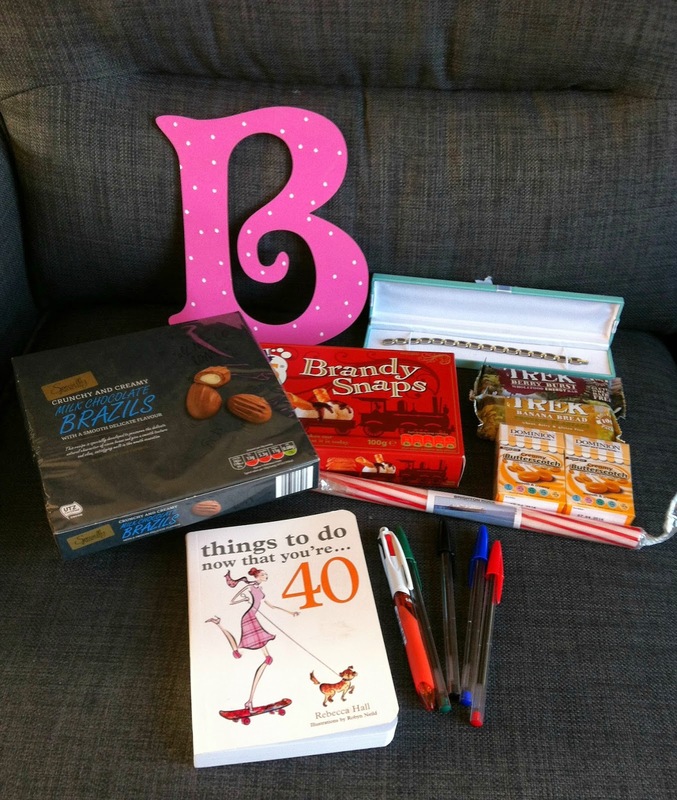 The budget is £40 which means an average of just £1 per item! So it's going to be a challenge! The starting point was coming up with a list of possible items beginning with a B. I put Mr MoaB and my Mum on the case to think of items too. Some of them are quite generic items such as 'book', whilst others are brands such as 'Bizzy Bee'. Quite quickly I had a list of over 50 items and at that point took the plunge and purchased the first item. It's fortunate that I have time on my side to compile all the items. This isn't something you can do as a last-minute present! Over the last few weeks, I've sent messages to some of the brands to see if they can help me out. I am chuffed that some of them have got back to me and I'm starting to receive some great things in the post to include! So far, I've managed to get 12 items and have spent the grand total of £4.03. Not a bad start at all! Brandy snaps - bought from Aldi for 69p. Butterscotch sweets - bought from Aldi for 99p. Brazil nuts - donated by my Mum who bought these to eat at Christmas but they were still lying around when I last visited so I nabbed them! Stick of Brighton Rock - bought from a Rock Shop for 85p. Book - when I put this on the list, I wasn't really sure what 'book' this would be. Maybe an author with 'B' initials? Then I came across this book called "Things to do now that you're 40" in a charity shop for £1. Couldn't be more perfect! Wooden decorated 'B' - I bought this for 50p at a car boot sale and am thinking that it may be used for decorating the 'Box' that all the items will go into. Bic Biros - a collection of pens which have kindly been sent to me by Bic. Banana Bread and Berry Burst Nakd bars - we have a friend who works for Nakd and at a recent meet-up she brought loads of bars with her. I asked her if I could take some extra ones home and went through and found the bars that have 'B' in their name! Bracelet - donated by my Mum who received it as a gift but doesn't wear bracelets. 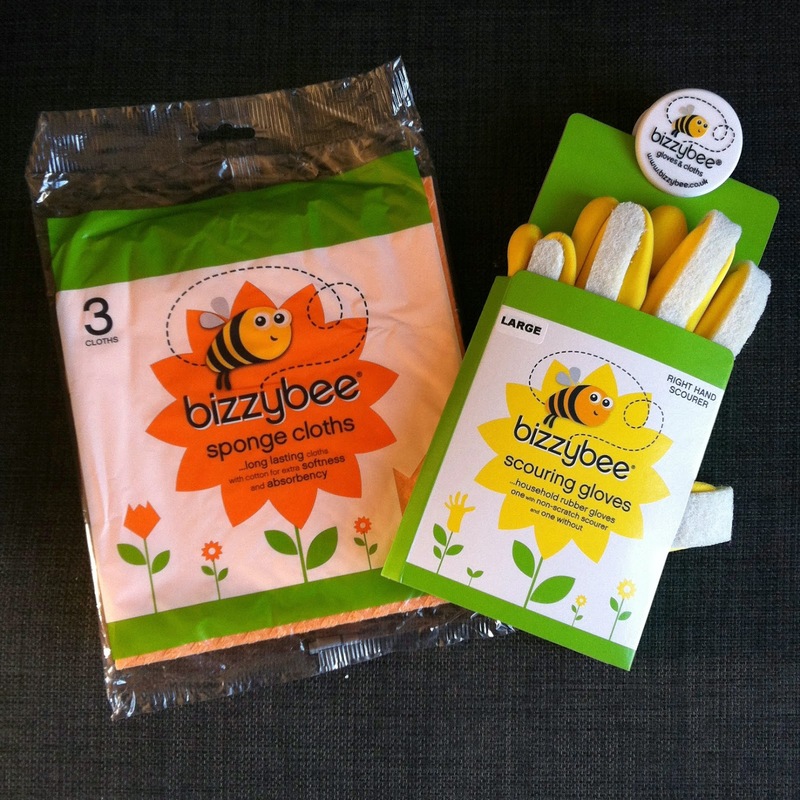 Bizzybee Cleaning Products - after contacting Bizzybee, they kindly sent me some fantastic cleaning items. Very gratefully received! I love their logo! Bouquet garni, Basil and Bay leaves - again, another kind donation from a company I contacted. These herbs were kindly sent to me from Schwartz. So another 29 items to go but I'm confident it can be done! I love a challenge! It is a really fun thing to do for the 'special' birthdays! You'll have to wait until she's 40 now! Thanks Ricky. It's a fun challenge and I'm determined to stick to our budget for the whole thing. Fingers crossed. Definitely glad it's quite an easy letter of the alphabet!